Arrange whole numerals from 1 through 9 in the grid above so that each numeral appears exactly once in each row, column, and three-by- three box. 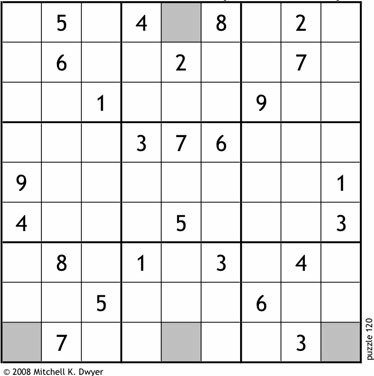 Then, arrange the numerals in the shaded cells to answer the trivia question, below. September 8 is the anniversary of the first performance at the Waikiki Shell. How old will it be? » Download the PDF file for this week's puzzle to your desktop and print it for convenience. » Download the solution PDF file for this week's puzzle to your desktop. Hawaii Baptist Academy and the University of Hawaii at Hilo.